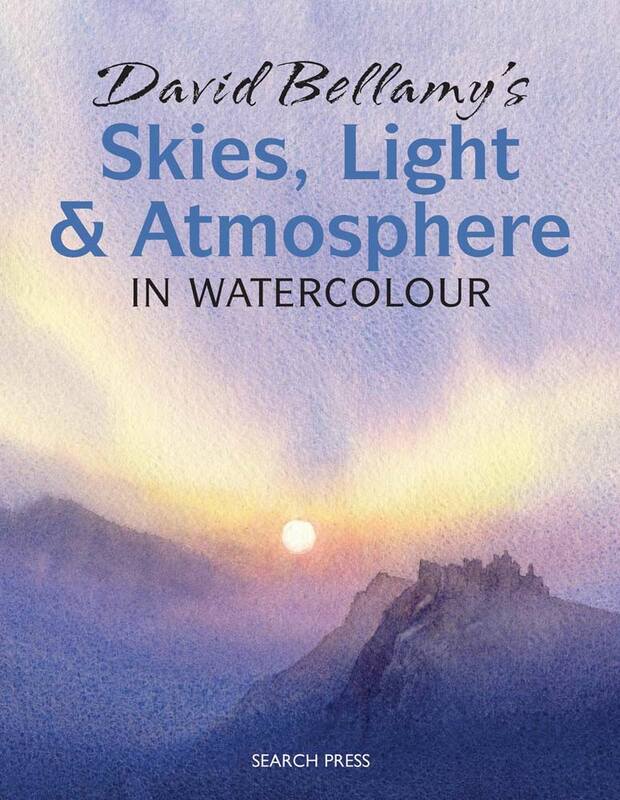 In this book covering elements of the landscape, renowned watercolourist, David Bellamy shows how to paint skies, light and atmosphere and how choices involving these three key elements can affect a painting. Starting with skies, David Bellamy covers basic techniques, composition, clouds, special effects like silver linings, sunsets and shafts of light, and much more, then there is a step by step dramatic sky demonstration. Next comes light, with plenty of advice including warm and cool light, using glazes, cast shadows, light from different directions, painting the sun and reflected light, followed by a step by step demonstration featuring strong light and shadow. The atmosphere section covers haze and mist, fog, mountains in cloud, smoke and steam, rain, storms and tranquil moods, and is followed by an atmospheric step by step painting of a waterfall. David Bellamy’s extensive travels and much admired painting style ensure that there are plenty of beautiful, inspiring paintings of skies, light and atmosphere throughout the book. If you are painting any outdoor scene there is probably going to be at least a patch of sky in it, and of course light of some sort. Find out how to get it right in watercolors in this book by award-winning artist David Bellamy. The premise of this book, as laid out in the introduction, is that even the dullest scene (perhaps as captured first on camera) the right light and atmosphere can lift the painting above the common run. All kinds of mood can be achieved if you know what to do, and this book shows the tricks of the artists trade and how to use them. It starts with the usual overview of what you need and why, then it is on with the lessons. Chapters each deal with a separate subject, such as skies, mood or atmosphere and are divided into samples of different effects and how they are done and longer tutorials. These show how to paint a simple picture in several stages (varying from twelve to twenty-four, not as many as in the beginners books). There are three of these projects where the artist can try out what has been learned just by reading and looking at samples, a good method and one I have found works. The pictures shown are from many other countries besides the UK so you can find out how to paint a wider range of weather and light. I would suggest that this is a book aimed pretty squarely at the improver; beyond the stage of the Ready To Paint or What To Paint series but not yet ready to leave behind the world of art instruction books. As if anybody ever is! Watercolour is the perfect medium for capturing the changing moods of skies. David Bellamy is an expert in this type of art and in this book, sets out to share some of the skills he has acquired over the years. He explains the techniques carefully and thoroughly in such a way that anyone, no matter whether they are a beginner or experienced artist, can follow him. There are clear step by step photographs showing how to achieve the various effects. It is a good way of learning how to paint different cloud types, silver linings, shafts of light, shadows, as well as getting the greatest effect from painting the sun. A good solid book, 'how to' book for artists with plenty of good advice and help. Regular readers of Leisure Painter will know that David Bellamy really understands the needs of the amateur painter and can provide clear instruction on how to paint all aspects of watercolour. In his latest book on the medium, David turns his attention to capturing what he regards as the three main ingredients of a successful painting: skies, light and atmosphere, explaining how even the most mundane of subjects can be transformed by the right lighting and mood. The book opens with information on materials needed to get started. Quite quickly thought David moves on to look at skies, and demonstrates various techniques, such as lifting out and wet in wet to create the effects you need. For example, types of clouds, sky compositions, sunsets, shafts of sunlight are all described clearly before David embarks on a 12-stage step-by-step demonstrations showing how to create a sky full of drama. Light comes next and further techniques are introduced, such as laying glazes to increase light effects, using cast shadows, directional, reflected or intense light. This is followed by a step-by-step demonstration of a cottage in a landscape to explore painting sunlight and shadow. The final section looks at atmosphere and a good selection of David's watercolours highlight the techniques that can be used to suggest atmospheric effects, such as space and distance, mist, rain squalls and snowfall. The closing demonstration is of a waterfall in which David puts into practice many of the techniques he has described. After some forays into more general books, its nice to see David getting back to the subjects hes best known for and, lets be honest, hes most comfortable with. The book follows Davids fairly discursive style, with explanations, examples and demonstrations for each section the three elements of the title are taken separately. Theres an excellent variety of material here, from mountains to landscapes and settings both in the UK and abroad, which makes for a good choice of approaches. Theres really not a lot more I can say. This is classic Bellamy and well up to the standard weve come to expect of him.